Many of the author's correspondents have enquired about the existence of coats of arms for the family. Alternatively they have shown her coats of arms which they claim as their own, having paid large sums of money to a business specialising in producing a coat of arms for a family of a particular name. It must be stated that the rules governing the right to bear arms are complicated and strict. Generally, however, one can only lay claim to a particular coat of arms if one can legally prove legitimate descent in the male line from the person to whom the arms were originally granted. A Coat of Arms does not “belong” to a name, it belongs to a particular person within a family with that name. The coats of arms associated with the FOSKETTs can be divided into two categories. 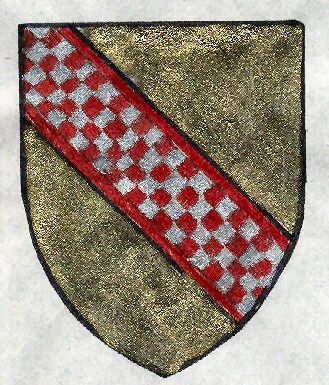 First the ancient arms associated with the mediaeval name of FOXCOTT, FOXCOTE or FOSCOTT and secondly more modern arms associated with the name FOSKETT. In the latter cases unless there are known living male descendants of the FOSKETTs to whom the arms were granted, no living FOSKETTs are able to claim these arms as their own. Unfortunately, the spread of these arms has occurred due to the unscrupulous peddling of Coats of Arms to the unwary. Emblazon: Quarterly, Ermine and gules, an arrow in bend sinister point upwards between in the first and fourth quarters a lion rampant. Owner: This coat of arms was granted to Lieutenant Colonel Joseph Foskett of Rosehill, Abbots Langley, Hertfordshire (1798-1875), Justice of the Peace and son of Joseph and Catherine Foskett. Lt Col Joseph Foskett was married to Mary Slack and they had no living children. For this reason there are no Fosketts who can claim this coat of arms as their own. Emblazon: Or, a bend chequy, gules and argent between two cotises of the second. Crest: A broken spear in pale, the end hanging in bend. Owner: It is believed that this coat of arms belonged to Joseph Foskett of More Place, Spitalfields, London (1760-1840). He became an extremely wealthy man, making his fortune in weaving. All his sons attended Oxford University where, on enrolment, they were stated as being from an armigerous family (a family with arms). One of these sons was Joseph Foskett with the coat of arms listed above. Despite having 7 sons, none of them produced a male heir, so this coat of arms also has no living Foskett claimants. It is also believed to be this Joseph Foskett who tried to disguise the humble beginnings of his branch of the family, by claiming that they were originally French Huguenots who had escaped from the persecutions in France. They were certainly non-conformists, but from other records it can be shown that the family came from Hitchin in Hertfordshire and probably before that from Buckinghamshire.